A full-contact game played between two teams of eleven players in protective kit. The safe and inclusive, non-contact version between teams of five players is called ‘Flag Football’. The award-winning versions offered by BAFA in the School Games include 3 v 3 games for primary schools and 5 v 5 for secondary. Each team aims to outscore the other, predominately by scoring ‘touchdowns’ – which involves carrying the ball into the opposition’s end-zone, similar to in rugby. Teams may also attempt field goals by attempting to kick the ball between two vertical goalposts. However, this can only be attempted from a standing start and not from open play. Each team has an offence and a defence. Only one of these will be on the field for any one team at the same time. The offence has four attempts to move the ball 10 yards up the pitch, or else they surrender the ball to the opposition. The most renowned event in American Football is the Super Bowl, an annual event which has been held each year since 1967 as the culmination of the National Football League (NFL) season. The most successful team in the sport’s history is the Pittsburgh Steelers, with six Super Bowl victories in eight appearances. The New England Patriots, the Dallas Cowboys, and the San Francisco 49ers have all won on five occasions. The NFL currently hosts multiple regular season games in the UK as part of their International Series. Games have been held at London’s Wembley Stadium since 2007, whilst Twickenham has also hosted fixtures since 2016. Tom Brady – the New England Patriots quarterback is perhaps the best known star that the sport has produced in the modern-day era, having led his team to five Super Bowl championships since his debut in 2000. He has also been selected for one of the two NFL Pro Bowl teams, like a ‘team of the season’, on twelve occasions. Joe Montana – a four-time Super Bowl champion with the San Francisco 49ers, predominately in the 1980s, ‘the Comeback Kid’ gained notoriety across the world for his ability to claw victory from the jaws of defeat, most famously in the 1989 Super Bowl, when the 49ers scored two touchdowns in the final quarter to earn a 20-16 victory. 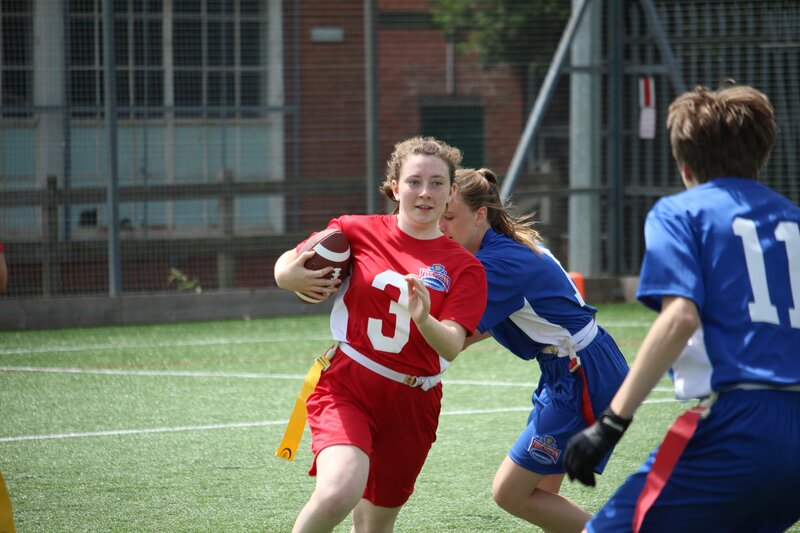 British American Football Association (BAFA) – please click here for more information. In order for a competition to be considered part of a School Games provision, it must follow a School Games format. All School Games registered users have access to our sport formats and can access the formats for this sport by clicking the button below. Alternatively, you can download the full American Football format pack by clicking here.